Does anyone remember the 774 that ran from Warwick to Bassendean? Last edited by insert_coin on Wed Aug 03, 2011 8:20 pm, edited 1 time in total. Climate change - a political tool to accuse "deniers". The climate changes every second and always will. Re: Obscure & forgotten services - who remembers? How about the 340 from Guildford to Hazelmere - from memory only once daily in each direction and a surely a contender for one of the shortest routes. This service survived until around 1999/2000 or so. I drove it several times, but I never remember getting a single passenger, despite having a Renault artic on at least one occasion. The trip ex Hazelmere was around 0930 or so, and it was quite pleasant sitting at the terminus, with the occasional interruption of a jet coming in to the Airport overhead. ah indeed 709 - what a grab! I ran a few out of the country club, Redcliffe, to the triangle myself. Never a soul on board from memory....I sensed it had to be an anachronism. That is one cool shot, when was it taken? Worth souveniring that wicked sign! I think it's still there in the Hazelmere triangle.....it's a great relic that needs grabbing!!! Go on GI....go get it! Alright, I will, next time I'm out Hazelmere way! Here is another equivelant trip to route 340. 128 Kwinana Hub - Masonic Homes. Travel time was 6 minutes. Another, that was gone during the late 80s, was the 216 (possibly 206?) that went from Claremont Station to Graylands Hospital, terminating at the old hospital building on top of the hill where St Louis Estate now is. That must have had a sub 10 minute running time, and I remember seeing it generally operated by Cubs in the mid 80s. Another that springs to mind was the 165 (Fremantle to North Fremantle) with just a couple of trips every day, which was deleted when the old 101 (Fremantle - Mt Claremont) had some trips diverted into North Fremantle. The current 107, from the time it was originally introduced in 2001 as the 70, follows part of the 165's old route into North Fremantle. There was also the 556 which was a short local trip from Belmont tp Belmont Shopping Centre (twice a day). Each of these trips was a one way trip - the return trips didn't align. Another trip I often ran in an arctic, but at least unlike the 340 you did actually pick up some passengers! This route was deleted in 2001 when the 200-209 were replaced by the 37. I remember that the resultant complaints led to some sort of replacement, whether by deviating the 37 or not I can't quite remember. Another short trip was the 557 from East Perth to Wellington Street, with just a couple of peak period trips. Up to the closure of the Head Office at Causeway, this trip commenced/terminated in Causeway Depot outside the entrance to Head Office. This service survived until around 2000 or so. (Apologies if I've swapped the 556 and 557 numbers - I could never remember which was which when I was operating them either!). I'm no expert when it comes to former route numbers, but I am pretty sure the 556 as UQB709 mentioned lasted longer than 2001, because the Transperth All Route September 2006 map shows the 556. According to that map, the Belmont Forum - Epsom Ave. in Belmont/Redcliffe of the current 284 is the former 556 route. 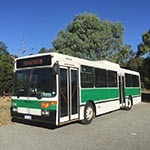 Here is a link to the Transperth Bus network Sheet 5 - Updated September 2006 which still shows the 556. If the route was indeed deleted in 2001, I'm puzzled why it is still present in the september 2006 map. Silver things overwhelming the Canning contract area..
UQB709 wrote: Another, that was gone during the late 80s, was the 216 (possibly 206?) that went from Claremont Station to Graylands Hospital, terminating at the old hospital building on top of the hill where St Louis Estate now is. That must have had a sub 10 minute running time, and I remember seeing it generally operated by Cubs in the mid 80s. There's a good pic of that 206/216 near the subway - the 206 went to McClemans (sic?) Rd; the 216 (you're correct 709) to the Hospital. Last edited by 900 series on Fri Aug 05, 2011 9:13 pm, edited 1 time in total. How about the 35, Karawara - Manning? That was a total of about 5 mins in cub from memory! OR (I think someone mentioned it elsewhere), the 368....Warwick - Alexander Heights? Can anyone remember a service numbered 197 that operated ex Booragoon (the old Booragoon bus station, not the new one) and where it went? Or does someone have timetable(s) for this server? If I am not mistaken, 197 would have been Boorgoon - Yangebup. route171 wrote: If I am not mistaken, 197 would have been Boorgoon - Yangebup. Thanks for that timetable, its just the information I wanted in order to bring back the old memories. I remember now, I used to catch a school special bus from school (Wesley College in South Perth) every day to Booragoon and half the time, the last 197 of the day had left meaning I had to go to the nearest payphone (no mobiles back then) and phone the parents to come pick me up. Going the other way in the morning meant being dropped off near Bull Creek shopping center and getting a school special bus to school from there. I managed to dig out this anachronistic relic. Imagine running a 35 ex-Manning to Karawara in a pre-steering-wheel attendant beast (with Armstrong no doubt), and having to whack up 31 pronto before commencing your next trip....all WITHIN 5 minutes? Love and respect those forbears of ours....they were really good at what they did! Oh, the memories. Do you have a timetable for the CityLink 884 and CityLink 885 after the latter was extended to Vellgrove Ave and Pegley Dve? Also do you have a timetable for routes 170-176 and 178-179 before the massive changes to the Canning contract area in 1998? What an exiting thread this is. What I found interesting was none of the Willetton termini on Corsair Dr. Is serviced today, although Burrendah Blvd (nearby) have the Circle route and 507.